Imagine, for a moment, that you have spent more than two decades in painfully laborious research-- that you have discovered an incredibly simple, electronic approach to curing literally every disease on the planet caused by viruses and bacteria . Indeed, it is a discovery that would end the pain and suffering of countless millions and change life on Earth forever. Certainly, the medical world would rush to embrace you with every imaginable accolade and financial reward imaginable. You would think so, wouldnt you? Unfortunately, arguably the greatest medical genius in all recorded history suffered a fate literally the opposite of the foregoing logical scenario. In fact, the history of medicine is replete with stories of genius betrayed by backward thought and jealously, but most pathetically, by greed and money. In the nineteenth century, Semmelweiss struggled mightily to convince surgeons that it was a good idea to sterilize their instruments and use sterile surgical procedures. Pasteur was ridiculed for years for his theory that germs could cause disease. Scores of other medical visionaries went through hell for simply challenging the medical status quo of day, including such legends as Roentgen and his X-rays, Morton for promoting the 'absurd' idea of anaesthesia, Harvey for his theory of the circulation of blood, and many others in recent decades including: W.F. Koch, Revici, Burzynski, Naessens, Priore, Livingston-Wheeler, and Hoxsey. So, you have just discovered a new therapy which can eradicate any microbial disease but, so far, you and your amazing cure aren't very popular. What do you do next? Well, certainly the research foundations and teaching institutions would welcome news of your astounding discovery. Won't they be thrilled to learn you have a cure for the very same diseases they are receiving hundreds of millions of dollars per year to investigate? Maybe not, if it means the end of the gravy train. These people have mortgages to pay and families to support. On second thought, forget the research foundations. Perhaps you should take your discovery to the pharmaceutical industry; certainly it would be of great interest to those protectors of humanity, right? But remember, you have developed a universal cure which makes drugs obsolete, so the pharmaceutical industry just might be less than thrilled to hear about your work. In fact, the bigshots might even make it certain that your human disease-ending technology never sees the light of day, by preventing it from becoming licensed by the regulatory agencies. Now, assuming your amazing cure is an electronic instrument, the only cost of using it is electricity. And it is absolutely harmless to patients, who can recover without losing their hair, the family home, and their life savings. So, with your technology, there is no longer any reason for people with cancer to pay over $300,000 per patient -- to become deathly ill from chemotherapy, radiation treatments, and the mutilation of surgery. It sounds like you won't find many friends and support among practicing oncologists, radiologists, and surgeons, doesnt it? You might try the hospitals and big clinics. But how thrilled are they going to be about a therapy administered in any doctor's office; which reverses illness before the patient has to be hospitalized? Thanks to you, the staffs of these institutions will essentially be out of work. Well then, how about the insurance companies? Surely, they would be delighted to save the expense of hospitalization - at least the companies which haven't invested in hospitals, where the staff is now sitting around waiting for someone to break a leg or be in a car accident...and the ones who don't lose policyholders as a result of your invention...and the companies which aren't trying to divest their pharmaceutical stock. Oh well, forget the insurance companies, too. It looks like you just might have a little problem with the medical establishment, no? Probably the only friends you'll have will be the patients and those progressive doctors who see change as an opportunity, rather than a threat to their established money-making monopoly. Those people will love you. But they don't call the shots. What follows, now, is the story of exactly such a sensational therapy and what happened to it. In one of the blackest episodes in recorded history, this remarkable electronic therapy was sabotaged and buried by a ruthless group of men. It has re-emerged in the underground medical/alternative health world only since the mid-80's. This is the story of Royal Raymond Rife and his fabulous discoveries and electronic instruments. If you have never heard of Rife before, prepare to be angered and incredulous at what this great man achieved for all of us only to have it practically driven from the face of the planet. But, reserve your final judgement and decision until after you have read this. Of course, some may regard this as just an amusing piece of fiction. However, for those who are willing to do some investigating on their own, there will be mentioned several highly-respected doctors and medical authorities who worked with Rife as well as some of the remarkable technical aspects of his creation. However, in the final analysis, the only real way to determine if such a revolutionary therapy exists is to experience it yourself. The medical literature is full of rigged 'double-blind' clinical research tests, the results of which are often determined in advance by the vested corporate interests involved. If FDA and other regulatory and licensing procedures and guidelines are observed, it is your privilege to experiment with this harmless therapy. So let's now turn to the story of the most amazing medical pioneer of our century. Royal Raymond Rife was a brilliant scientist born in 1888 and died in 1971. After studying at Johns Hopkins, Rife developed technology which is still commonly used today in the fields of optics, electronics, radiochemistry, biochemistry, ballistics, and aviation. It is a fair statement that Rife practically developed bioelectric medicine himself. He received 14 major awards and honors and was given an honorary Doctorate by the University of Heidelberg for his work. During the 66 years that Rife spent designing and building medical instruments, he worked for Zeiss Optics, the U.S. Government, and several private benefactors. Most notable was millionaire Henry Timkin, of Timkin roller bearing fame. Because Rife was self-educated in so many different fields, he intuitively looked for his answers in areas beyond the rigid scientific structure of his day. He had mastered so many different disciplines that he literally had, at his intellectual disposal, the skills and knowledge of an entire team of scientists and technicians from a number of different scientific fields. So, whenever new technology was needed to perform a new task, Rife simply invented and then built it himself. Rife's inventions include a heterodyning ultraviolet microscope, a microdissector, and a micromanipulator. When you thoroughly understand Rife's achievements, you may well decide that he has the most gifted, versatile, scientific mind in human history. 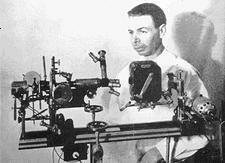 By 1920, Rife had finished building the world's first virus microscope. By 1933, he had perfected that technology and had constructed the incredibly complex Universal Microscope, which had nearly 6,000 different parts and was capable of magnifying objects 60,000 times their normal size. With this incredible microscope, Rife became the first human being to actually see a live virus, and until quite recently, the Universal Microscope was the only one which was able view live viruses. Modern electron microscopes instantly kill everything beneath them, viewing only the mummified remains and debris. What the Rife microscope can see is the bustling activity of living viruses as they change form to accommodate changes in environment, replicate rapidly in response to carcinogens, and transform normal cells into tumor cells. Rife painstakingly identified the individual spectroscopic signature of each microbe, using a slit spectroscope attachment. Then, he slowly rotated block quartz prisms to focus light of a single wavelength upon the microorganism he was examining. This wavelength was selected because it resonated with the spectroscopic signature frequency of the microbe based on the now-established fact that every molecule oscillates at its own distinct frequency. The atoms that come together to form a molecule are held together in that molecular configuration with a covalent energy bond which both emits and absorbs its own specific electromagnetic frequency. No two species of molecule have the same electromagnetic oscillations or energetic signature. Resonance amplifies light in the same way two ocean waves intensify each other when they merge together. The result of using a resonant wavelength is that micro-organisms which are invisible in white light suddenly become visible in a brilliant flash of light when they are exposed to the color frequency that resonates with their own distinct spectroscopic signature. Rife was thus able to see these otherwise invisible organisms and watch them actively invading tissues cultures. Rife's discovery enabled him to view organisms that no one else could see with ordinary microscopes. More than 75% of the organisms Rife could see with his Universal Microscope are only visible with ultra-violet light. But ultraviolet light is outside the range of human vision, it is 'invisible' to us. Rife's brilliance allowed him to overcome this limitation by heterodyning, a technique which became popular in early radio broadcasting. He illuminated the microbe (usually a virus or bacteria) with two different wavelengths of the same ultraviolet light frequency which resonated with the spectral signature of the microbe. These two wavelengths produced interference where they merged. This interference was, in effect, a third, longer wave which fell into the visible portion of the electromagnetic spectrum. This was how Rife made invisible microbes visible without killing them, a feat which today's electron microscopes cannot duplicate. By this time, Rife was so far ahead of his colleagues of the 1930's(! ), that they could not comprehend what he was doing without actually traveling to San Diego to Rife's laboratory to look through his Virus Microscope for themselves. And many did exactly that. One was Virginia Livingston. She eventually moved from New Jersey to Rife's Point Loma (San Diego) neighborhood and became a frequent visitor to his lab. Virginia Livingston is now often given the credit for identifying the organism which causes human cancer, beginning with research papers she began publishing in 1948. Virginia Livingston, in her papers, renamed it Progenitor Cryptocides. Royal Rife was never even mentioned in her papers. In fact, Rife seldom got credit for his monumental discoveries. He was a quiet, unassuming scientist, dedicated to expanding his discoveries rather than to ambition, fame, and glory. His distaste for medical politics (which he could afford to ignore thanks to generous trusts set up by private benefactors) left him at a disadvantage later, when powerful forces attacked him. Coupled with the influence of the pharmaceutical industry in purging his papers from medical journals, it is hardly surprising that few heave heard of Rife today. Meanwhile, debate raged between those who had seen viruses changing into different forms beneath Rife's microscopes, and those who had not. Those who condemned without investigation, such as the influential Dr. Thomas Rivers, claimed these forms didn't exist. Because his microscope did not reveal them, Rivers argued that there was "no logical basis for belief in this theory." The same argument is used today in evaluating many other 'alternative' medical treatments; if there is no precedent, then it must not be valid. Nothing can convince a closed mind. Most had never actually looked though the San Diego microscopes...air travel in the 1930's was uncomfortable, primitive, and rather risky. So, the debate about the life cycle of viruses was resolved in favor of those who never saw it (even modern electron microscopes show frozen images, not the life cycle of viruses in process). Nevertheless, many scientists and doctors have since confirmed Rife's discovery of the cancer virus and its pleomorphic nature, using darkfield techniques, the Naessens microscope, and laboratory experiments. Rife also worked with the top scientists and doctors of his day who also confirmed or endorsed various areas of his work. They included: E.C. Rosenow, Sr. (longtime Chief of Bacteriology, Mayo Clinic); Arthur Kendall (Director, Northwestern Medical School); Dr. George Dock (internationally-renowned); Alvin Foord (famous pathologist); Rufus Klein-Schmidt (President of USC); R.T. Hamer (Superintendent, Paradise Valley Sanitarium; Dr. Milbank Johnson (Director of the Southern California AMA); Whalen Morrison (Chief Surgeon, Santa Fe Railway); George Fischer (Childrens Hospital, N.Y.); Edward Kopps (Metabolic Clinic, La Jolla); Karl Meyer (Hooper Foundation, S.F. ); M. Zite (Chicago University); and many others. Rife ignored the debate, preferring to concentrate on refining his method of destroying these tiny killer viruses. He used the same principle to kill them, which made them visible: resonance. By increasing the intensity of a frequency which resonated naturally with these microbes, Rife increased their natural oscillations until they distorted and disintegrated from structural stresses. Rife called this frequency 'the mortal oscillatory rate,' or 'MOR', and it did no harm whatsoever to the surrounding tissues. Today's Rife instruments use harmonics of the frequencies shown on the display screen. The wavelength of the actual frequency shown (770hz, 880hz, etc.) is too long to do the job. This principle can be illustrated by using an intense musical note to shatter a wine glass: the molecules of the glass are already oscillating at some harmonic (multiple) of that musical note; they are in resonance with it. Because everything else has a different resonant frequency, nothing but the glass is destroyed. There are literally hundreds of trillions of different resonant frequencies, and every species and molecule has its very own. It took Rife many years, working 48 hours at a time, until he discovered the frequencies which specifically destroyed herpes, polio, spinal meningitis, tetanus, influenza, and an immense number of other dangerous disease organisms. In 1934, the University of Southern California appointed a Special Medical Research Committee to bring terminal cancer patients from Pasadena County Hospital to Rife's San Diego Laboratory and clinic for treatment. The team included doctors and pathologists assigned to examine the patients - if still alive - in 90 days. After the 90 days of treatment, the Committee concluded that 86.5% of the patients had been completely cured. The treatment was then adjusted and the remaining 13.5% of the patients also responded within the next four weeks. The total recovery rate using Rife's technology was 100%. On November 20, 1931, forty-four of the nation's most respected medical authorities honored Royal Rife with a banquet billed as The End To All Diseases at the Pasadena estate of Dr. Milbank Johnson. At first, a token attempt was made to buy out Rife. Morris Fishbein, who had acquired the entire stock of the American Medical Association by 1934, sent an attorney to Rife with 'an offer you can't refuse.' Rife refused. We many never know the exact terms of this offer. But we do know the terms of the offer Fishbein made to Harry Hoxsey for control of his herbal cancer remedy. Fishbein's associates would receive all profits for nine years and Hoxey would receive nothing. Then, if they were satisfied that it worked, Hoxsey would begin to receive 10% of the profits. Hoxsey decided that he would rather continue to make all the profits himself. When Hoxsey turned Fishbein down, Fishbein used his immensely powerful political connections to have Hoxsey arrested 125 times in a period of 16 months. The charges (based on practice without a license) were always thrown out of court, but the harassment drove Hoxsey insane. But Fishbein must have realized that this strategy would backfire with Rife. First, Rife could not be arrested like Hoxsey for practising without a license. A trial on trumped-up charges would mean that testimony supporting Rife would be introduced by prominent medical authorities working with Rife. And the defense would undoubtedly take the opportunity to introduce evidence such as the 1934 medical study done with USC. The last thing in the world that the pharmaceutical industry wanted was a public trial about a painless therapy that cured 100% of the terminal cancer patients and cost nothing to use but a little electricity. It might give people the idea that they didn't need drugs. The first incident was the gradual pilfering of components, photographs, film, and written records from Rife's lab. The culprit was never caught. 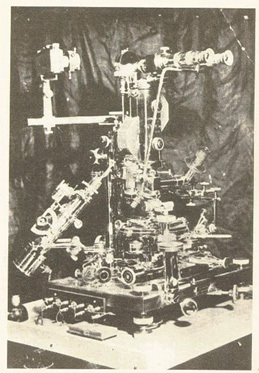 Then, while Rife struggled to reproduce his missing data (in a day when photocopies and computers were not available), someone vandalized his precious virus microscopes. Pieces of the 5,682 piece Universal microscope were stolen. Earlier, an arson fire had destroyed the multi-million dollar Burnett Lab in New Jersey, just as the scientists there were preparing to announce confirmation of Rife's work. But the final blow came later, when police illegally confiscated the remainder of Rife's 50 years of research. Then in 1939, agents of a family which controlled the drug industry assisted Philip Hoyland in a frivolous lawsuit against his own partners in the Beam Ray Corporation. This was the only company manufacturing Rife's frequency instruments (Rife was not a partner). Hoyland lost, but his assisted legal assault had the desired effect: the company was bankrupted by legal expenses. And during the Great Depression, this meant that commercial production of Rife's frequency instruments ceased completely. And remember what a universal cure meant to hospitals and research foundations? Doctors who tried to defend Rife lost their foundations grants and hospital privileges. On the other hand, big money was spent ensuring that doctors who had seen Rife's therapy would forget what they saw. Almost no price was too much to suppress it. Remember that, today, treatment of a single cancer patient averages over $300,000. It's BIG business. Thus, Arthur Kendall, the Director of the Northwestern School of Medicine who worked with Rife on the cancer virus, accepted almost a quarter of a million dollars to suddenly 'retire' in Mexico. That was an exorbitant amount of money in the Depression. Dr. George Dock, another prominent figure who collaborated with Rife, was silenced with an enormous grant, along with the highest honors the AMA could bestow. Between the carrots and the sticks, everyone except Dr. Couche and Dr. Milbank Johnson gave up Rife's work and went back to prescribing drugs. To finish the job, the medical journals, support almost entirely by drug company revenues and controlled by the AMA, refused to publish any paper by anyone on Rife's therapy. Therefore, an entire generation of medical students graduated into practice without ever once hearing of Rife's breakthroughs in medicine. The magnitude of such an insane crime eclipses every mass murder in history. Cancer picks us off quietly...but by 1960 the casualties from this tiny virus exceeded the carnage of all the wars America ever fought. In 1989, it was estimated that 40% of us will experience cancer at some time in our lives. In Rife's lifetime, he had witnessed the progress of civilization from horse-and-buggy travel to jet planes. In that same time, he saw the epidemic of cancer increase from 1 in 24 Americans in 1905 to 1 in 3 in 1971 when Rife died. He also witnessed the phenomenal growth of the American Cancer Society, the Salk Foundation, and many others collecting hundreds of millions of dollars for diseases that were cured long before in his own San Diego laboratories. In one period, 176,500 cancer drugs were submitted for approval. Any that showed 'favorable' results in only one-sixth of one percent of the cases being studied could be licensed. Some of these drugs had a mortality rate of 14-17%. When death came from the drug, not the cancer, the case was recorded as a 'complete' or 'partial remission' because the patient didn't actually die from the cancer. In reality, it was a race to see which would kill the patient first: the drug or the disease. The inevitable conclusion reached by Rife was that his life-long labor and discoveries had not only been ignored but probably would be buried with him. At that point, he ceased to produce much of anything and spent the last third of his life seeking oblivion in alcohol. It dulled the pain and his acute awareness of half a century of wasted effort - ignored - while the unnecessary suffering of millions continued so that a vested few might profit. And profit they did, and profit they do. In 1971, Royal Rife died from a combination of valium and alcohol at the age of 83. Perhaps his continual exposure to his own Rife frequencies helped his body endure abuse for so many years. Fortunately, his death was not the end of his electronic therapy. A few humanitarian doctors and engineers reconstructed his frequency instruments and kept his genius alive. Rife technology became public knowledge again in 1986 with the publication of The Cancer Cure That Worked, by Barry Lynes, and other material about Royal Rife and his monumental work. There is wide variation in the cost, design, and quality of the modern portable Rife frequency research instruments available. Costs vary from about $1200 to $3600 with price being no legitimate indicator of the technical competence in the design of the instrument or performance of the instruent. Some of the most expensive units have serious technical limitations and are essentially a waste of money. At the other extreme, some researchers do get crude results from inexpensive simple, unmodified frequency generators, but this is just as misguided as spending too much money. Without the proper modifications, the basic frequency generator gives only minimal and inconsistent results. Please recall that the actual destruction of the viruses and bacteria, etc. is not accomplished by the frequency displayed on these cheap generators, but by certain shorter harmonics of that particular frequency which are often blocked by the crudity of a cheap and rudimentary instrument itself. This very problem led Rife to ultimately abandon the 'ray tube' design in favor of today's version. The newer technology applies the frequencies and their harmonics to the body through the use of hand-held, footplate, or stick-on electrodes. Proper frequency exposure and flushing of the body with large amounts of clean, pure water is critical to achieve the kind of results Rife got. These procedures are fully explained in the manuals of the best units on the market. So, unless you would be satisfied with sporadic results for minor conditions, it is suggested you use only the highest quality equipment and only the proper, proven procedures in your personal research. If you do, you may discover that nothing can approach what can be achieved through the application of these safe, time-tested frequencies (many for over 65 years)- and all without drugs, surgery, or radiation. One day, the name of Royal Raymond Rife may ascend to its rightful place as the giant of modern medical science. Until that time, his fabulous technology remains available only to the people who have the interest to seek it out. While perfectly legal for veterinarians to use to save the lives of animals, Rife's brilliant frequency therapy remains taboo to orthodox mainstream medicine because of the continuing threat it poses to the international pharmaceutical medical monopoly that controls the lives - and deaths - of the vast majority of the people on this planet.